Charlie O’Dell Neely was born June 29, 1936 in Dekalb, Mississippi to Clay and Ina Neely. Charlie accepted The Lord as his personal Savior at a young age at Center Ridge Baptist Church, in Dekalb, MS. He graduated from Whisenton High School where he was a star basketball player. In 1956 Charlie moved to Cleveland , Ohio. 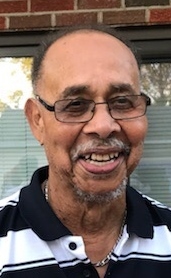 Upon moving to Cleveland( Berea) he worked with his brother Ben (Snook) and his friends James ( Hootie) and Thomas (Buddy) Butler and Clinton Dotson in their plastering business .He began working at General Motors Chevrolet Plant in Parma in 1961 and for over 40 years until he retired in 2002. Charlie met Martha Graham Naylor and they married in 1965, and to this union they had 2 daughters Tina and Kim. He later married Rubye Davis in 2003. Charlie was an avid sports fan! He was a Browns season ticket holder for many years. He also loved the Cavaliers and spending time with his buddies. To forever love and cherish the memory of Charlie is his loving and devoted wife Rubye , his beloved daughters, Tina Byers (Kelvin), Kim Jennings ( Brent), step sons Geoffrey Davis ( Mari) and Chris Davis( GiGi) . Grandchildren ; Guy Turner ( Erin) , Kevin Turner, Kira Byers, Jamar Robinson, Tracy Davis , Sinclair Davis, Wynn Davis and Elle Davis. Great Grandchildren Guy and Genesis Turner. Sister , Lanolia Washington , Cleveland , Ohio, Brothers, Jimmie Neely, ( Jennie) , Berea, Ohio, Marvin Neely ( Louise) and Ed Neely both of Rock Island , Illinois. Charlie was preceded in death by his parents Clay and Ina Neely , brothers Henry Clay( Bro), James (Thump), and Ben ( Snook) , sisters, Ella Johnson and Mary Jo Reed and granddaughter Nicole Busch.